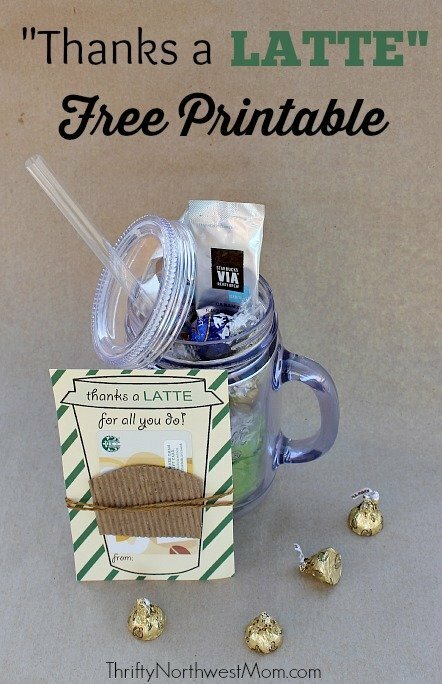 Thanks a Latte FREE Printable – Great Idea for Teacher Gift! 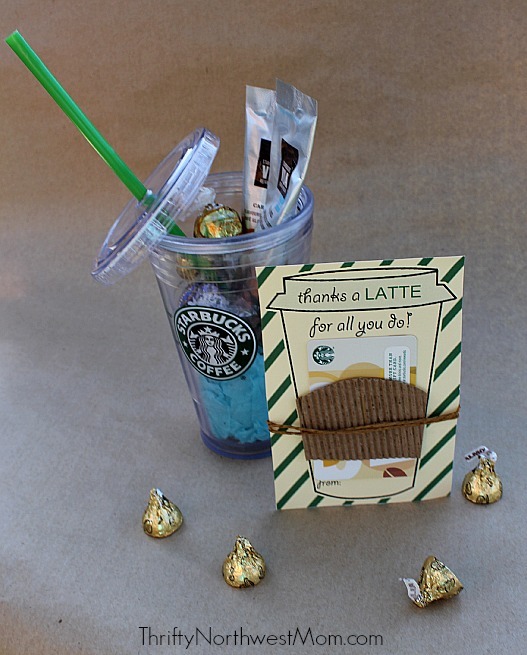 Thanks a Latte FREE Printable – Perfect for Teacher Gifts, Father’s Day & more! With it being time for Christmas gifts for teachers, neighbors & more, we wanted to remind you about this fun, and free printable you can use for those who love Starbucks, or other local coffee shop gift cards! We’ve got a fun, FREE printable we created that you could use for a variety of different gifts for the coffee lover in your life! 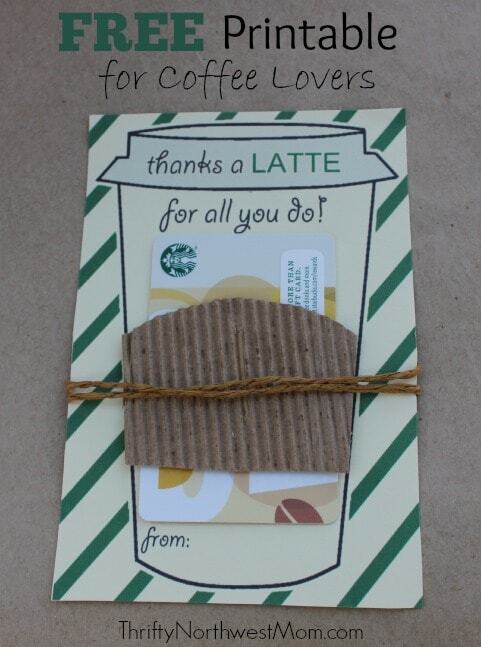 It’s a fun way to dress up a gift card in a creative way, or add it to a little gift you put together for a coffee lover! This would be great for a teacher gift for teachers- instead of giving a traditional coffee mug, give a reusable water cup, so they can use it all year long & in the classroom & fill it up with their favorite drinks. Or just give it as a thank-you gift to someone. Grab a Starbucks card or better yet, find your teacher’s favorite coffee stand and buy a gift card (my husband prefers this as he can then earn his stamps towards free drinks). You can just give the card with the gift card attached or give them a little gift set with the reusable drink as well! You could just print this out on cardstock at home for a quick, simple gift or if you have time, you could upload the PDF to a photo site & print it off at a place such as Costco, Walgreens, etc. so that it will be glossy & professional looking. I just printed mine on cardstock and I think it turned out great (I used cream cardstock since that’s what I had on hand). This card is so simple to make – if you want to make it really easy, just print off the FREE printable on cardstock or photo paper and then glue your coffee gift card right on there. That makes a unique card right there! For the gift set, I had a cute plastic, mason jar reusable cup that I got from a friend & I thought it was the perfect cup! I’ve seen similar ones at Walmart, Costco (in the past -not sure if they’re there now), Michaels & more. I added in some Starbucks Via as well as some yummy chocolates to make it a fun gift for the coffee lover! You could also use a Starbucks reusable cup (prices typically start around $9.95 & up). These cups hold up so well – I love mine! They also now have glass Starbucks reusable cups, too, if they prefer glass over plastic. 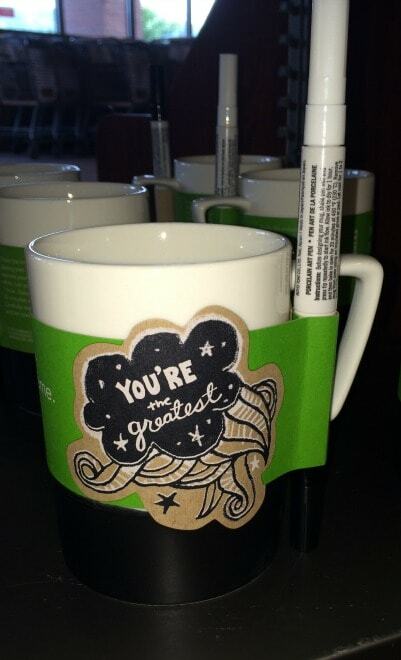 Another fun idea for a Coffee Gift is to pick up this Starbucks Chalkboard mug – not the most frugal at $14.95, but you can all sign it with the special pen (or just have the kids sign/decorate the mug) & then you bake it so that it sets it & what a unique gift. Add our fun FREE printable card along with a gift card & some chocolates for a unique, personalized gift! There are some many fun uses for this FREE “Thanks a Latte” printable, so make sure to pin it now so you don’t forget about this fun gift printable for those coffee lovers in your life! If you’re looking for more teacher gifts, make sure to check out all of these Teacher Gift Ideas we have.